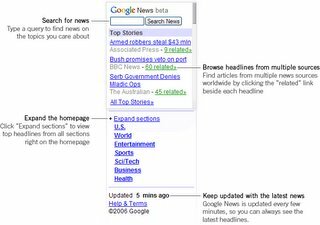 Google has just announced the release of Google News for mobiles. This fills a niche I've been currently filling using mobile RSS readers. This is a neater solution as I already rely on Google News when not on the road (or in the train). Google has been agressively targeting the mobile space for a while now, and with good reason. People are becoming more and more connected, so it makes sense to provide mobile friendly versions of the tools people have come to depend on when at the desk.